As a Winstonite, you’ve probably heard about the closing of highway 40-B (Business 40) through downtown Winston-Salem for years. The stretch of highway that runs for approximately one mile through downtown Winston-Salem will close, beginning November 17, 2018, for at least 14 months. Once it has reopened, Business 40 will be renamed Salem Parkway, with a speed limit of 55 mph. Which Part Of Business 40 Is Affected? The construction on Business 40 will take place from US-52 to Peters Creek Parkway. Construction for the Peters Creek Parkway section began earlier this year and is expected to be completed in the winter of 2018. The main impact of the project, the full closure of Business 40, is expected to begin in November 2018, after the Peters Creek Parkway portion is completed and open to traffic. Business 40 has old on and off-ramps and tight curves from the days when cars didn’t travel as fast as they do today. If you’ve visited downtown Winston-Salem and gotten on and off Business 40 you no doubt know what we’re talking about. On the on-ramp, you need to wait and then gun the engine when you see enough space to “merge”. Likewise, drivers in the right lane frequently have to pull into the left lane to let people to enter. The renovation will address these issues – replacing most old bridges on and over Business 40, creating longer on and exit ramps, widening shoulders and creating new ones, removing and replacing pavement, smoothing out the tight curves, building portions of a multi-use section from Lockland Avenue to Liberty Street and create a safer and more durable roadway. Why Is Business 40 Being Closed Completely? Citizens of Winston-Salem city were surveyed over the past decade to get their opinion on whether Business 40 should close completely for a couple of years, or for six years, and keeping one lane open at all times. The decision to complete the repair in two years has a fiscal impact as well – money will be saved, in addition to the repairs being completed more quickly. It was somewhat close though – 61% of survey respondents said they preferred to have the work completed in two years. Work will be done to improve 11 bridges, making them more aesthetically pleasing at the same time that they are fortified and made more stable. Winston-Salem has been called the City of the Arts & Innovation. This will hopefully give designers a chance to bring passers-by into the artistic world of our city. For a full project timeline, visit here and note that construction dates are subject to change. The NCDOT encourages drivers to think ahead, to plan their routes and carpool. Here is a list of commuting strategies. NCDOT is working with Google Maps to create a Business 40 version of the traffic mobile app WAZE to help. A mobile app will be created to make drivers aware of traffic flow, accidents, and congestion. How do you feel about the Business 40 renovation plans? I remember the old I-40 through downtown, with the exits seemingly every 100 yards. Back when it was built, the city has to take what it could get. If you want nostalgia, try driving I-74 across the Centennial Bridge into Davenport IA-much the same experience! You say “For a full project timeline, visit here…”, but the link to http://business40nc.com/en-us/pages/Timeline.aspx comes back 404 for me. I found https://www.business40nc.com/Pages/default.aspx, but I haven’t examined it yet to see that it tells me everything. Thanks, Bob! They update the site and their links constantly. I’ve updated some of the links. Thanks for keeping us on our toes. Drive safely! 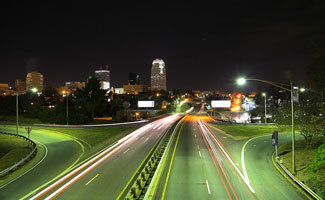 As a returning citizen of Winston-Salem, I recall a time before the bypass was even a twinkle in the eye of the city. I-40 was the main thoroughfare thru the city. Of course, the city has grown substantially over these past 40+ years, and so has traffic. Personally, I avoid Business 40 like the plague. The entrances and exits are too scary small to me, lanes are not sufficient, etc. So, yes, I’m glad that it will be closed for 2 years for a redo. CreativeCorridors.org has been working to improve the bridges among business 40. You can find some renderings on their website. I tried visiting your site to see the bridge renderings but I get a “not secure” error in my browser? Does anyone have any updates for what is going on with the planned closing/lane reduction for bridge construction on business 40 through downtown Winston Salem? I heard there is a group working on making this a fancier bridge opportunity rather than just concrete redo of the same nature. If anyone knows anything, can you please post here? really useful information i must say… thanks for the great info. put it in my bookmarks and will be checking back soon.